Some artworks demand close reading. Sandwiched between the two main upstairs galleries at Bury Art Museum right now you will find two of them, courtesy of Liverpool Biennial’s touring programme, and both concern acts of violence. One is text-based, while the other is a film featuring a woman’s face in a bleak, dramatic landscape. 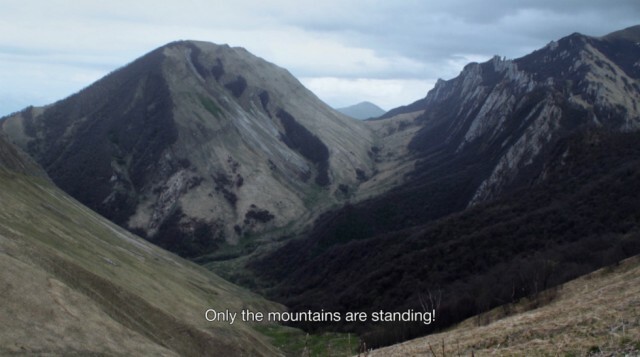 The film, Keicheyuhea (2017), by Aslan Gaisumov, records his grandmother’s return to the site of her former home in the mountains of Chechnya, where, 73 years earlier, towards the end of the Second World War, she and her family were displaced by Soviet forces. Something paradoxical takes place here. What we see and what she knows are so different from one another that we become increasingly curious as to why she, the elderly woman, bent with age, but still strong, is so baffled and amazed by what she’s returned to. The sense of a place “where many people used to live” is remote, because now, as she also observes, “There are no wild animals anymore, nothing to see…” When she spots two stones in the distance, she realises they mark the area where her own house used to be. But we don’t see the two stones, we just see her looking at them, distancing us further. 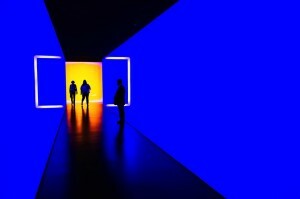 Memory and loss are as closely interweaved as the fingers held tight behind the woman’s back, as she walks, stands, and mourns without shedding a tear. Confronting you as you walk away from this is Fight (2018), a series of four posters by Canadian artist Janice Kerbel. 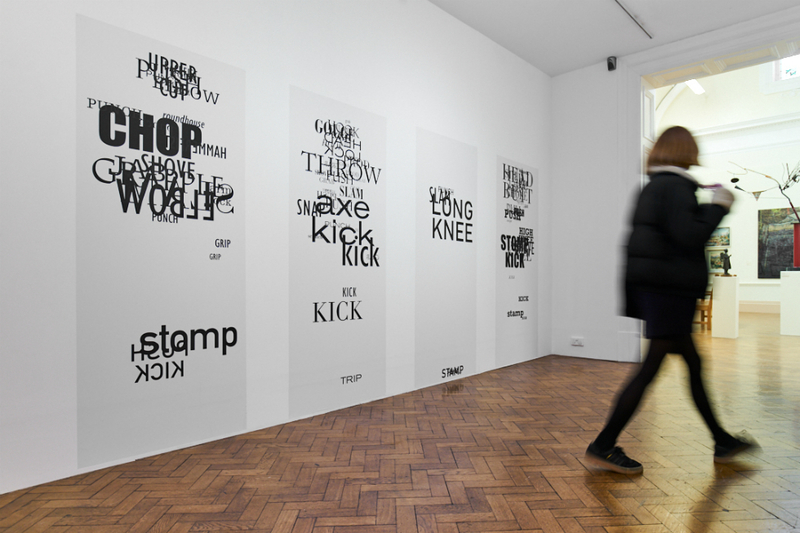 Each as high as a human, the posters use silkscreen-printed words to describe a choreographed fight that originally involved twelve unarmed participants. Every move, every impact, appears in words on a poster at the height it happened in relation to someone’s body. We see no humans here, but Kerbel’s use of words communicates bodily collision and interaction forcefully. 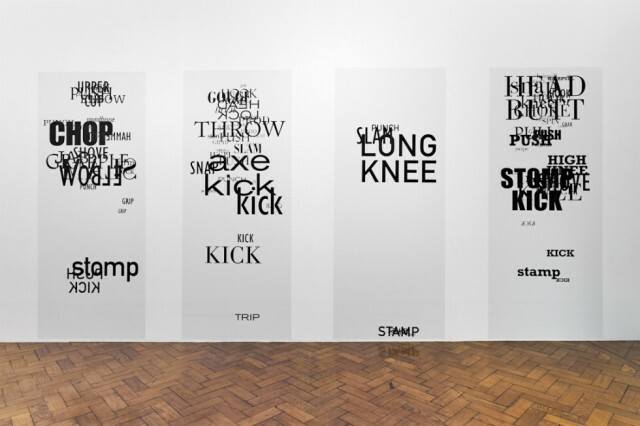 Using lettering in different fonts, and in uppercase as well as lower, simple words like “stomp” “hairpull” and “gouge,” grouped together as they are here, all suddenly acquire a deeply unpleasant quality. 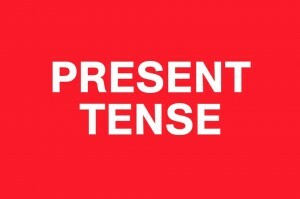 Words frequently overlap and are sometimes printed backwards, recording the way a fight breaks out, twists and turns, uses up energy and emotion, and collapses eventually from pain and exhaustion, necessitating rest and silence before breaking out again. Reading these words as you walk from poster to poster is like rerunning the fight, of course. The more you read, the more you are also being battered by words. And in continuing to read, the more you also feel like a potential participant. I found myself asking: do I want to see this fight through to the end? Would I want to see any fight through to the end? Fights, of the physical sort, are not pleasant, but as this artwork warns, they can draw you in. And, as both these artworks remind us, the memory of violence goes on to disturb.